A strobe light can be put to a wide range of applications. A light effect to add a professional quality to a party or disco where it gives the dancers the impression of interrupted or frozen motion. As a warning light or for pohtographic work and scientific experiments where moving objects are involved. 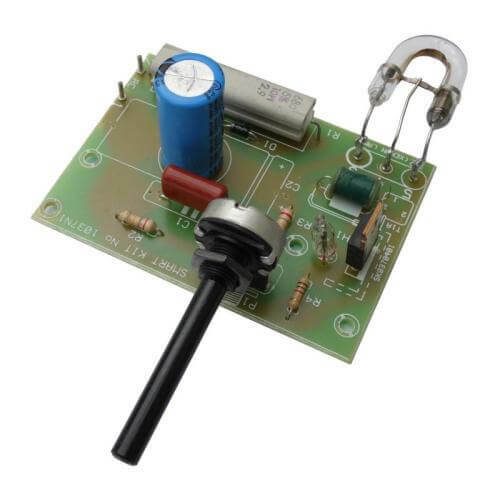 This kit features a very bright 8 Watt xenon strobe tube and a potentiometer provides frequency adjustment in the range of approximately 1 to 60Hz. You can add a second xenon tube to increase light output further still. Kit includes solder. Strobe Lighting Safety Uunder some conditions strobe lights may induce epilepsy in flicker-sensitive individuals. The risk of seizures is believed to be lower when the flash rate is below 5 Hz (5 flashes per second).Whenever strobe lights are used, arrange for a prior warning to be given.